This is the third installment in a series on locating, selecting, and maintaining used tractors for the small farm. In the first installment (Fall 2014), we discussed some of the features that you would be looking for on a good used tractor for your small farm. In the second installment (Winter 2015), we described places to find and purchase a tractor. In this article, we will cover some of the maintenance activities that are needed to keep your tractor running efficiently on a daily basis, and to avoid ending up with costly repairs. The Operator’s Manual has critical information that you need to have to keep your tractor running well. An efficiently running tractor can be critical to the successful operation of your farm. I think of my own farm during this frigid and snowy winter that we are having in Central New York State. With over 100 ewes that are going through lambing at this time and a herd of beef cattle that need to be fed, I need to move heavy round bales around the farmstead several times a week. Tractors that don’t start can leave me stranded and my animals hungry. I am also constantly moving huge amounts of snow. 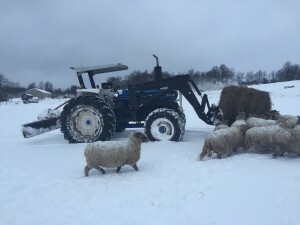 The frigid, cold, and windy conditions that we are experiencing pose several challenges to keeping tractors running which will be addressed in this article. 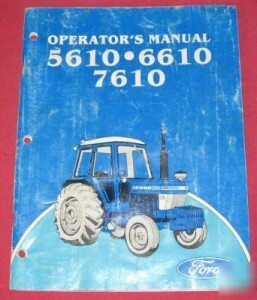 One of the most important items that you need to first acquire for your tractor is the owner’s or operator’s manual. Oftentimes, when you purchase a used tractor, you do not get an owner’s manual with it, though you can find them easily from either an equipment dealer or online. It is critical that you have one for your machine so that you know how to operate your particular tractor, when to schedule routine maintenance, and where to find the different capacities for all of the fluids which must be maintained in the tractor. In addition to the owner’s manual, you will need a simple set of common mechanics tools to accomplish many of the needed maintenance and simple repairs that normally occur with a tractor, along with a good quality grease gun. Engine oil levels, and oil filters. Purchase the highest quality lubricants that you can find; don’t be “penny wise and pound foolish” and try to scrimp on these items. Check dipstick levels on a daily basis! Transmission oil levels, hydraulic oil levels, and respective filters. On some tractors the transmissions and hydraulic systems are combined, on others, they may require different types of lubricants. Again, check levels daily! Battery fluid levels and battery terminal condition. A properly functioning alternator determines how well your battery stays charged. Additionally, a good battery charger and booster can oftentimes save the day in bitterly cold weather to get those sluggish batteries functioning. 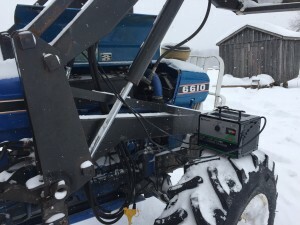 The author attempts to get his tractor used for feeding livestock running in below zero temperatures, with a block heater, and a battery booster/charger. Fuel filters (especially critical on diesel engines). Change them frequently, and before harsh weather conditions challenge all fuel systems! Fuel additives that help prevent and/or break up fuel system freeze ups can be quite useful too. Correct grade of fuel for the season. In colder weather, diesel engines need to have electric block heaters installed, and the correct grade of fuel used. Winter fuel is often a mixture of diesel fuel and kerosene; check with your supplier for details. If you use summer grade fuel in your tractor, the fuel system and filters can gel up; this can be quite aggravating when your tractor quits a good distance from a building; how will you get it started in frigid cold weather now that it’s marooned a long way from electricity? It is also a good idea to keep your fuel tank filled as full as possible during the winter as this can help prevent condensation from accumulating in the fuel system. Radiator coolant strengths and levels. Coolant should be rated to -30 degrees F. Check levels often. Don’t shortchange this activity; if there is not enough coolant in the cooling system, you can freeze and burst your engine or result in overheating. A malfunctioning radiator thermostat can cause cooling system problems too. Tire conditions and correct pressures. It is imperative that you have a good quality tire gauge and air compressor to keep tires at the correct pressure. Rear tires in particular are extremely expensive! Grease fittings filled with the correct grade of lubricant. Buy good quality grease and be on a first name basis with your grease gun! Power steering fluid levels. This level must be maintained or the machine will be very difficult to steer, even more so in cold weather. Front wheel bearing grease levels. Hopefully your front tires have grease fittings that alleviate you taking apart the front wheel bearings in order to pack them with lubricant. Air conditioning coolant levels. If the tractor cab has an A/C unit. Air filter condition. Tremendous volumes of clean air must respire through the engine to keep it running. Electrical and fuel gauges working. Nothing is more aggravating than having the tractor run out of fuel at the most inconvenient time. This results is having to “bleed” the fuel system to get unneeded air out of it; it seems to happen only on Sundays and holidays! Belt conditions for generators or alternators, tightened to the correct specifications. The electrical system will not function as it should if belts are loose or frayed. A tractor fitted to remove the ever present winter snows we have been having and a front end loader spear to feed round bales. Regular maintenance is critical for winter operations. Slow Moving Vehicle (SMV) emblems. This is a matter of safety for both operators and passenger vehicle drivers. It is also required by law if traveling on public roadways. Tractor brakes, and emergency and parking brakes working correctly. For safety and legal reasons. Personal protective equipment (Roll Over Protective Structures or ROPS) and seat belts installed and used. For older tractors, incentive programs exist to install ROPS systems. Lights, flashers, and turn signals all operational. Again, for legal and safety reasons. Correct hardware for hitching implements. Includes draw pins, three point hitch hardware, and sway chains. You absolutely need to have the correct hardware, specific to whatever type of three point hitch system that you have, such as Category I, II, etc. Correctly mounted tire chains if conditions warrant. Checking all of these items at specified intervals will ensure that your tractor will operate safely, efficiently, and add measurably to its useful life. By keeping your tractor under cover at least during periods of cold, inclement weather, and having the right accessories as mentioned in this article you will be able to accomplish your tasks in a timely, aggravation free manner. Rich Taber is Grazing and Ag Economic Development Specialist with Cornell Cooperative Extension of Chenango County. He also owns and operates a 165 acre farm in nearby Madison County, where he raises beef cattle, sheep, pastured poultry, and has a very productive woodlot as well. Rich Taber can be reached at 607-334-5841 ext. 21, or email rbt44@cornell.edu. Helpful post. In your article you say “the Operator’s Manual has critical information.” That’s very true, but can be an issue for many owners of older model tractors – they don’t have the owner’s manual. If that’s the case for you, take a look at the http://www.tractor-manuals-downunder.com website. They carry manuals for many vintage tractors, and they’ll email you a digital copy so you don’t have to wait for a printed verion to get shipped to you. I would recommend reaching out to the author of the article, Rich Taber with your question. He can be reached at: rbt44@cornell.edu.